Pennsylvania State Police say trooper ambush suspect Eric Frein performed extensive Internet research on how to avoid police manhunts. He also researched law enforcement technology and survival skills. Lt. Col. George Bivens said Friday afternoon that police looked through the hard drive of a computer used by Frein and found his search history. Bivens says that based on the contents of the hard drive, police believe Frein spent several years planning to ambush a state police barracks. "I suspect he wants to have a fight with the state police, but I think that involves hiding and running since that seems to be the way he operates," Bivens said. "I expect that he'll be hiding and try to take a shot from some distance from a place of concealment, as he has done in the past." The 31-year-old survivalist is charged with opening fire at the Blooming Grove barracks on Sept. 12, killing one trooper and injuring another. He's been on the run ever since. 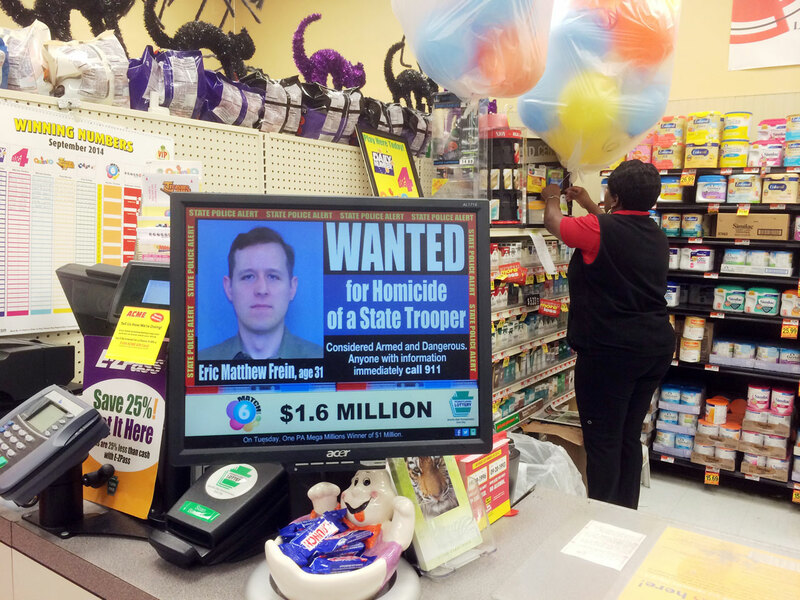 The ambush attack landed Frein on the FBI's most wanted list, and police have been authorized to use deadly force. Police believe he's hiding in the woods around his parents' home in Canadensis. Frein has managed to elude hundreds of law enforcement officials looking for him 20 miles away in the thick woods of northeastern Pennsylvania, taking advantage of the difficult terrain to keep them at bay two weeks after the late-night shooting outside a rural barracks that killed one trooper and injured another. Police on Friday searched a shuttered, derelict 113-year-old resort that Frein had been known to visit when it was open. The 400-room Buck Hill Inn, close to the main search area, was featured in a 2001 episode of MTV's "Fear." State police spokesman Trooper Tom Kelly said Frein hadn't been spotted there and police were simply clearing it. Bivens said there is nothing to indicate Frein has left the area and called the fugitive a "coward." "We are not intimidated and we will not leave," Bivens said. "We have a clear mission with specific objectives - protect the community, find you, and bring you to justice." The 31-year-old self-styled survivalist appears to have purposely made himself visible to police at times, staying just far enough away to make it unlikely he'd be caught in the rough terrain. Julie Martin and Eddie Starnater, who teach wilderness survival and "traditional living" skills at their school Practical Primitive in Great Meadows, New Jersey, say a person can easily lose himself or herself in the woods. "You can't see 10 feet into that," said Starnater, motioning to a patch of vegetation in this stretch of the Delaware Water Gap National Recreation Area. "And they have to pay attention to every foot of it. . particularly when you've got somebody who's armed who wishes you ill."
Concealed by the hemlock, Martin said she could see the trail perfectly. But "as long as I don't move," she said, "you would walk right past me and never see me." Frein, an avid war re-enactor who police say hates law enforcement, is wearing diapers so he can remain stationary for long periods of time, according to state police. Trackers have found soiled diapers and empty packs of Serbian cigarettes that Frein is believed to have left behind. Authorities believe they have Frein contained in a 5-square-mile perimeter around his parents' home in Canadensis. Police dogs have picked up his scent but lost it at streams and other water crossings. Besides having the ability to conceal himself, Frein probably has stockpiles of food and supplies, according to Martin and Starnater. Even if he doesn't, though, there's still a fairly ample supply of nuts, roots and other wild edibles this time of year, as well as small game and insects, they said. "What we now call 'survival,' Martin said, "300 years ago they just called it 'Wednesday.'"